This mild-flavored yogurt starter is easy to use and produces thick, creamy yogurt. Perfect for beginners and busy people alike. 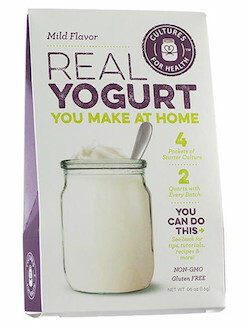 With no starter to maintain, you can make yogurt when you like and refrigerate the remaining packets for later. Ingredients: Lactose, live active cultures (Bifidobacterium lactis, Lactobacillus acidophilus, Lactobacillus delbrueckii subsp. bulgaricus, Lactobacillus delbrueckii subsp. lactis, Streptococcus thermophilus). Manufactured in a facility that also processes products containing soy and dairy. Gluten-free, Non-GMO. Use 1 packet with 1-2 quarts milk (for larger batches, use 2 packets with 1-4 gallons milk). Cultures at 110ºF using a yogurt maker or other appliance.